I walked through the softly lit entrance of Perfectly Imperfect Creations only to be greeted with hugs and laughter. Part-owners Chris and Rachele Schalow and Rachele’s parents Steve and Melissa Bergey made me feel like family as we sat around a beautifully crafted dining table, one of many items available in their store. I walked through the softly lit entrance of Perfectly Imperfect Creations only to be greeted with hugs and laughter. Part-owners Chris and Rachele Schalow and Rachele’s parents Steve and Melissa Bergey made me feel like family as we sat around a beautifully crafted dining table, one of many items available in their store. I was amazed at how easily the conversation flowed, and how they answered my questions as a unit. This warm embrace of conversation was present through the entire interview and is just one reason customers look forward to stopping in. 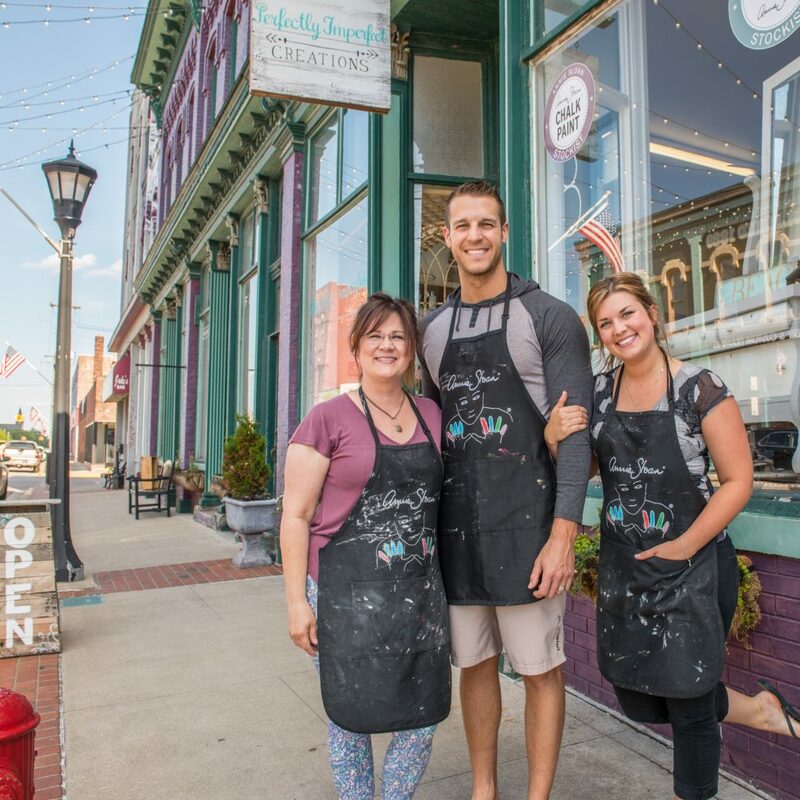 Downtown Bay City, but the enthusiasm within is nothing short of amazing. 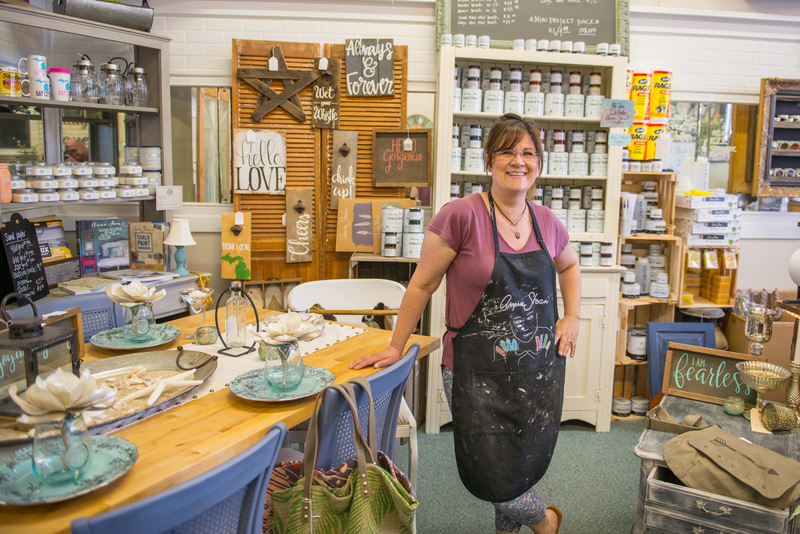 “My favorite part of owning the business is the people we get to meet,” said Melissa. Everyone else shook their head in agreement. In addition to the “Annie Sloan Paint” and their custom order option, Rachele and Melissa also enjoy teaching paint techniques in the workshop. Melissa surrounded by their stock of Annie Sloan Paint. 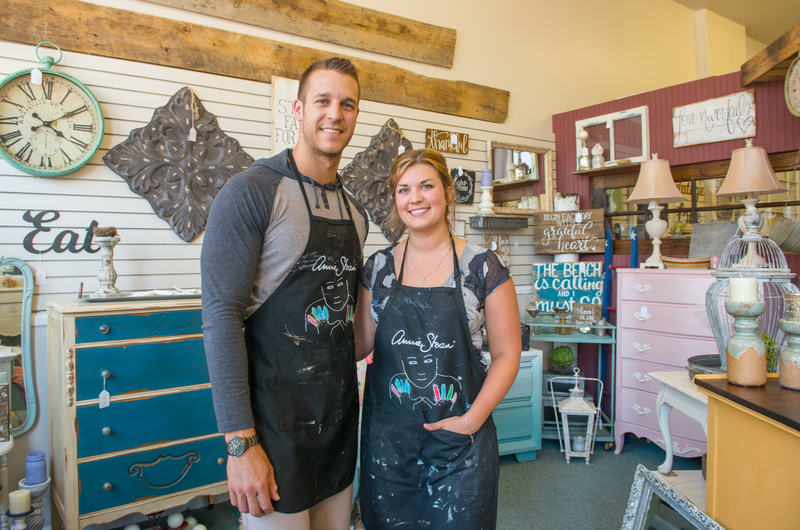 Chris and Rachele with a few of their one of a kind hand painted pieces. I got a peek of the families’ competitive side when Rachele brought up their current “Dresser-off.” “Everyone is throwing $5 in” and whoever sells their dresser first wins the money. The group erupted into laughter at Rachele’s explanation, although I’m pretty sure I sensed some tension in the air. As the family began to speak of their other obligations, I knew I was talking to a group of hardworking people. All four of them have full-time jobs, plus, Chris is going to school. This business is a creative outlet for all of these lovely people and I could tell they are proud of the pieces they make. I’m grateful they took some time to speak with me and delighted to have such genuine people here in Downtown Bay City.